Last week Chile’s National Energy Commission awarded contracts for the supply of 1,200 gigawatt hours of energy to unregulated customers in Chile. Thirty-one companies competed for the 20-year contracts, with wind and solar projects going head-to-head on price with coal generation plant. As the winners were announced the results threw up some significant game changers which echo a new and exciting trend we’re starting to see more frequently in high-growth markets. 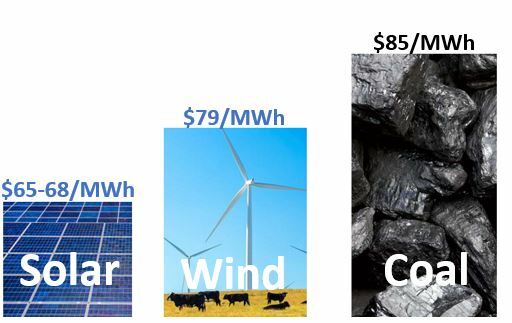 Wind and solar outbid fossil fuels on price, resulting in 100% of the power contracted being awarded to wind and solar. Wind and solar outbid coal on price. The average price of $79.30 per megawatt hour (MWh) was a 40% drop from the $130/MWh in similar tender held in 2013 and prices ranged from $65/MWh to $97/MWh. Notably, AES Gener, the second largest power generator in Chile, bid a price of $85/MWh for power backed up 100% by a coal power plant. 65% of the total power will be supplied by two wind farms in central Chile which bid a price of $79/MWh. These wind farms have been developed by global wind and solar company Mainstream Renewable Power which has one of the largest portfolios of wind and solar projects in Chile. The remainder will come from three solar projects which ranged in price from $65 to $68/MWh. Break-through for storage A solar thermal company will deliver 39 GWh at US$97/MWh in two overnight blocks via storage of energy collected from the sun during daylight hours. This price from solar thermal via storage is a major breakthrough, with energy analysts assuming far higher costs for solar thermal-based projects.